The Frontline Medical Communications Society Partners group has a 15-year track record of forging strategic alliances with key societies. FMC Society Partners assists these important professional associations with their membership communications by offering high-quality and innovative programs and services. Frontline provides expert journalists, writers, graphic designers, print and e-production experts, and sales and marketing help – as well as years of experience in developing state-of-the-art print and digital products for physicians in 30+ specialties. Frontline’s partnership with SHM began January 2017. Specialty information and the numerous properties are below. The Journal of Hospital Medicine (JHM)–the official journal of SHM. JHM is the premier peer-reviewed, indexed (Web of Science, PubMed) publication for the specialty of Hospital Medicine, and is dedicated to publishing evidence that will transform care of the hospitalized patient. The Hospitalist–the official newsmagazine of the SHM. For over 20 years The Hospitalist has reported on issues and trends in the practice of hospital medicine, reaching more than 33,000 hospitalists, physician assistants, nurse practitioners, residents, and medical administrators interested in the practice and business of hospital medicine. SHM Career Center— The SHM-endorsed career site for hospitalists is the destination for hospital medicine specialists seeking employment as well as professional recruiters. HM Daily News—the official show daily newspaper of the SHM annual meeting. American College of Surgeons: First published in 2005, ACS Surgery News, in print and online, covers the world of general surgery with breaking news, on-site medical meeting coverage, and expert perspectives. News from ACS keeps active members up-to-date on issues affecting their daily practice as well educational opportunities and policy initiatives. All articles are researched, written, and produced by a full-time staff of professional medical journalists. American Gastroenterological Association: GI & Hepatology News has been the official newspaper of the AGA Institute since launched in collaboration with Frontline om 2007. Nearly 18,000 gastroenterologists and hepatologists rely on GI & Hepatology News to deliver breaking news, on-site medical meeting coverage, and expert perspectives both in print and online. This site provides award-winning daily news coverage, columns and commentaries, videos, podcasts, and special reports that are accessible online and through e-mails and newsletters. Physicians join the conversation through social media options. CHEST (the American College of Chest Physicians): CHEST Physician is the essential news publication for nearly 19,000 specialists in pulmonary disease and critical care medicine. Since 2006, CHEST Physician has provided independent reporting that keeps these specialists up-to-date with the latest clinical and practice economics news, educational opportunities and policy initiatives. Society for Vascular Surgery: Vascular Specialist is produced in partnership with SVS to provide high-quality reporting and commentary focused on impacting the way vascular surgeons and related specialties practice medicine. News from SVS keeps members up-to-date on educational opportunities and policy initiatives. 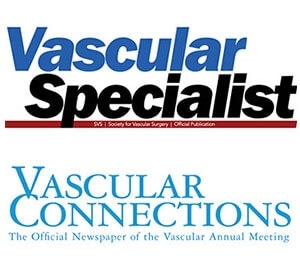 Vascular Specialist has been the official newspaper of SVS since 2005. The Preview issue of Vascular Connections is mailed as a polybagged ride-along with Vascular Specialist approximately four weeks prior to the meeting; a digital Preview edition is e-mailed to nearly 5,000 vascular medicine specialists. Three issues of Vascular Connections are distributed at the annual meeting – reaching an average 4,000 attendees. EULAR Congress News is the official daily newspaper of the annual meeting of the European League against Rheumatism. Frontline has been the publisher of this essential onsite vehicle since 2004. Two digital editions and three onsite print editions are produced each year and the combined package has become a valuable resource for the 15,000 annual attendees as well as for those rheumatology specialists unable to attend. Online editions are available at www.eularcongressnews.com.